Juan Jung Universidad de Barcelona y Centro de Estudios de Telecomunicaciones de Latinoamérica (cet.la). Resumen. El presente articulo pretende estudiar si la adopcion y el uso de banda ancha impactan positivamente en la propension a innovar, en el caso de una muestra de empresas de America Latina. Para ello se utiliza una base de datos de encuestas a empresas realizadas por el Banco Mundial en 2006 y 2010. A partir de estos datos se estiman, para diversas medidas de actividad innovadora, modelos econometricos que controlan la potencial endogenidad entre las variables de innovacion y banda ancha. Los resultados sugieren, para la muestra relevada, que el hecho de acceder a una conexion de banda ancha y utilizarla en forma intensa genera para las empresas de la region incrementos considerables en la probabilidad de introducir nuevos procesos, nuevos productos, y en patentar internacionalmente. El control de la endogenidad incrementa significativamente el resultado del impacto atribuido a la banda ancha, lo que es consistente con otros estudios de la literatura. El motivo podria ser la presencia de factores inobservables que influencien la actividad innovadora, pero que esten negativamente correlacionados con la disponibilidad de banda ancha. Universidad de Barcelona y Centro de Estudios de Telecomunicaciones de Latinoamérica (cet.la). Profesor de Introducción a la Economía, Universidad de la República. Acs, Z., y Audretsch, D. (1988). “Innovation in Large and Small Firms: An Empirical Analysis”. The American Economic Review, 78 (4), pp. 678-690. Aghion, P.; Harris, C.; Howitt, P., y Vickers, J. (2001).“Competition, Imitation and Growth with Stepby- Step Innovation”. Review of Economic Studies, 68 (3), pp. 467-492. Aghion, P.; Bloom, N.; Blundell, R.; Griffith, R.; y Howitt, P. (2005). “Competition and Innovation: An Inverted U Relationship”. Quarterly Journal of Economics, 120 (2), pp. 701‑728. Aghion, P., y Bolton, P. (1992). “An Incomplete Contracts Approach to Financial Contracting”. Review of Economic Studies, 59 (3), pp. 473-494. Aghion, P.; Angeletos, G.; Banerjee, A., y Manova, K. (2010)”. Volatility and Growth: Credit Constraints and the Composition of Investment”. Journal of Monetary Economics, 57 (3), pp. 246-265. An Empiricists Companion. Princeton, NJ: Princeton University Press. Añón Higón, D. (2012). “The impact of ICT on innovation activities: Evidence for UK SMEs”. International Small Business Journal, 30 (6), pp. 684-699. Arvanitis, S., y Loukis, E. N. (2009). “Information and communication technologies, human capital, workplace organization and labor productivity: a comparative study based on firm-level data for Greece and Switzerland”. Information Economics and Policy, 21 (1), pp. 43-61.
on the New Economy, Londres. Balboni, M., Rovira, S., y Vergara, S. (2011), “ICT in Latin America: concluding remarks”. In Balboni, M., Rovira, S., y Vergara, S. (eds. ), ICT in Latin America: A microdata analysis, CEPAL-IDRC. Basberg, B. (1987). “Patents and the measurement of technological change: a survey of the literature”. Research Policy, 16, pp. 131-141. Benhabib, J., y Spiegel, M. (1994). “The role of human capital in economic development. Evidence from aggregate cross-country data”. Journal of Monetary Economics, 34, pp. 143-173. Bertschek, I., Cerquera, D., y Klein, G. (2013). “More Bits - More Bucks? Measuring the Impact of Broadband Internet on Firm performance”. Information Economics and Policy, 25, pp. 190-203. Brynjolfsson, E., y Hitt, L. (2000). “Beyond Computation: Information Technology, OrganizationalTransformation and Business Performance”. Journal of Economic Perspectives, 14 (4), pp. 23-48. Brynjolfsson, E., y Saunders, A. (2010). Wired for innovation: How Information Technology Is Reshaping the Economy. Cambridge, MA: MIT Press. Cameron, C., y Trivedi, P. (2005). Microeconometrics. Methods and Applications. Cambridge. Cardona, M., Kretschmer, T., y Strobel, T. (2013). “ICT and productivity: conclusions from the empirical literature”. Information Economics and Policy, 25, pp. 109-125. Charlo, G. (2011). Impact of ICT and innovation on industrial productivity in Uruguay. En ICT in Latin America: A microdata analysis (2011). Coe, D., y Hoffmaister, A. (1999). Are There International R&D Spillovers Among Randomly Matched Trade Partners? A Response to Keller. IMF Working Paper 99/18, February. Cohen, W., y Klepper, S. (1996). “A reprise of size and R&D”. Economic Journal, 106, pp. 925-951. Cohen, W., y Levinthal, D. (1989). “Innovation and Learning: the two faces of R&D”. Economic Journal, 99 (397), pp. 569-596. Comisión Europea (2008). An Economic Assessment of ICT Adoption and its Impact on Innovation and Performance. Study report 10/2008. A Cross-Sector e-Business Watch Study by DIW Berlin. Colecchia, A., y Schreyer, P. (2002). “ICT investment and economic growth in the 1990s: is the United States a unique case? A comparative study of nine OECD countries”. Review of Economic Dynamics, 5, pp. 408-442. Czernich, N.; Falck, O.; Kretschmer, T., y Woessman, L. (2011). “Broadband infrastructure and economic growth”. 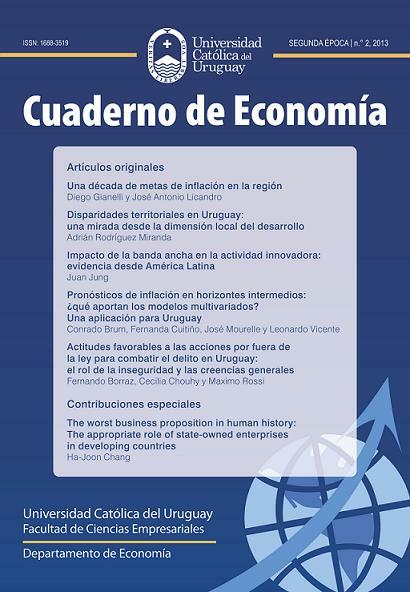 The Economic Journal 121 (552), pp. 505-532. Dernis, H., y Khan, M. (2004). Triadic Patent Families Methodology, OECD Science, Technology and Industry Working Papers, 2004/02, OECD Publishing. Economist Intelligence Unit (2009). A new ranking of the world’s most innovative countries: Notes on methodology. Forman, C., y van Zeebroeck, N. (2010). From Wires to Partners: How the Internet has Fostered R&D Collaborations Within Firms. SSRN eLibrary 1725780. Fornefeld, M.; Delaunay, G., y Elixmann, D. (2008). The impact of Broadband on Growth and Productivity. A study on behalf of the European Commission. of national innovative capacity”. Research Policy, 31 (2002), pp. 899-933. Gilchrist, V.G., y Town, R. (2001). Productivity and the PC revolution. UC Irvine, Working paper, Center for Research on Information Technology and Organizations. Gordon, R.J. (2000). “Does the ‘New Economy’ measure up to the great inventions of the past?”. Journal of Economic Perspectives, 14 (4), pp. 49-74.
regime”. Econometrica, 48 (3), pp. 75-96. Greene, W. (1999). Análisis econométrico. Madrid: Pearson Educación, 3.a ed., 1999. Griffith, R.; Huergo, E.; Mairesse, J., y Peters, B. (2006). “Innovation and productivity across four European countries”. Oxford Review of Economic Policy, 22 (4), pp. 483-498.
services”. Economics of Innovation and New Technology,14 (4), pp. 277-303. INFODEV / Banco Mundial (2007). “ICT, Innovation, and Economic Growth in Transition Economies: A Multi-Country Study of Poland, Russia, and the Baltic Countries”. Washington, DC. Jorgenson, D.W. (2001). “Information technology and the US economy”. American Economic Review, 91 (1), pp. 1-31. Jovanovic, B., y Rousseau, P. L. (2005). “General purpose Technologies”. In Aghion, P.; Durlauf Steven,N. (eds. ), Handbook of Economic Growth, vol. 1B. Ámsterdam: Elsevier, pp. 1181‑1224. Katz, R. (2012). Impact of broadband on the economy. Broadband series. Telecommunication Development Sector. International Telecommunications Union. Keller, W. (2002). “Trade and the Transmission of Technology”. Journal of Economic Growth, 7, pp. 5-24. Keller, W. (2004). “International Technology Diffusion”. Journal of Economic Literature, vol. XLII (setiembre), pp. 752-782. Lederman, D.; Messina, J.; Pienknagura, S., y Rigolini, J. (2014). Latin American Entrepreneurs: Many Firms but Little Innovation. Washington, DC: World Bank, doi: 10.1596/978-1-4648-0012-2. License: Creative Commons Attribution CC BY 3.0. Lee, G. (2006). “The Effectiveness of International Knowledge Spillovers Channels”. European Economic Review, 50, pp. 2075-2088. Lee, H. L. (2000). “Creating Value through Supply Chain Integration”. Supply Chain Management Review, setiembre-octubre, pp.30-36. Lewbel, A. (2007). “Coherency and completeness of structural models containing a dummy endogenous variable”. International Economic Review, 48 (4), pp. 1379-1392. Oz, E. (2005). “Information technology productivity: in search of a definite observation”. Information & Management, 42 (6), pp. 789-798. Pilat, D. (2004). The ICT productivity paradox: insights from micro data. OECD Economic Studies 38, 2004/1. Qiang, C., y Rossotto, C. M. (2009). “Economic Impacts of Broadband”. In Information and Communications for Development 2009: Extending Reach and Increasing Impact, pp. 35-50. Washington DC: WB. Romer, P (1990). “Endogenous Technological Change”.Journal of Political Economy, 98 (5). S71 S102. York Times, 12 de julio, Book Review, 36. Sternitzke, C. (2009). “Defining triadic patent families as a measure of technological strength”. Scientometrics, 81 (1), octubre, pp. 91-109. Stiroh, (2002). “Are ICT Spillovers Driving the New Economy?”. Review of Income and Wealth, 48 (1), pp. 33-57, March 2002. Watanabe, C.; Tsuji , Y., Y Griffy-Brown, C. (2001).“Patent statistics: deciphering a ‘real’ versus a ‘pseudo’ proxy of innovation”. Winter, S. (1984). “Schumpeterian Competition in Alternative technological Regimes”. Journal of Economic Behavior and Organization, 5, setiembre- diciembre, pp. 287‑320.